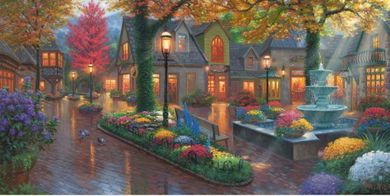 Home | New Releases | Mark Keathley Hand Signed and Numbered Limited Edition Hand Embellished Canvas Giclee:"Village Evening"
Edition: Signed and Numbered Edition to 1035 total editions. About the Art: Every time I visit Gatlinburg, my all-time favorite spot to meander around it is a quaint little spot called �The Village�! It is like stepping back in time and experiencing a moment in history when life was filled with personal encounters with shop owners and friends, cool evening air and favorite experiences. The Village was dreamed into existence in 1965 at the beginning of America�s Road trip vacation experiences across our great land by a couple of local families. It almost became a Holiday Inn, at one time, but instead, they hoped they could create an experience that would draw people in and off the busy Parkway to unique shops such as the Donut Friar and other fabulous enterprises and beautiful European style architecture. This they did! As you enter the brick entrance gate from the Parkway one steps back in time to brick paved courtyards, fountains, shade trees and building styles reminiscent of the old world. Here, it seems to be OK to be a kid again and indulge our �vacation selves� with delightful sights and wonderful tastes. Home | Framed Art | Religious Art | Mark Keathley | Mark Keathley Hand Signed and Numbered Limited Edition Hand Embellished Canvas Giclee:"Village Evening"
Home | Fine Art Prints & Limited Editions | Infinity Fine Art | Mark Keathley | Mark Keathley Hand Signed and Numbered Limited Edition Hand Embellished Canvas Giclee:"Village Evening"